Hiking and camping opportunities abound throughout the state's ancient mountain ranges, many of which have eroded into beautiful rolling monadnock hills and feature spectacular carved rock formations. North Carolina is also home to the UNESCO World Heritage Site Great Smoky Mountains National Park, the most-visited national park in the United States. Carolina Beach State Park is one of Pleasure Island's loveliest natural getaways, offering a respite from the nearby hustle and bustle of the attractions of the Carolina Beach Boardwalk. The 761-acre park, which is located 10 miles north of the city of Wilmington, is located along the Intracoastal Waterway and the Cape Fear River and is jointly operated by the State of North Carolina and the Department of the Army. It is designated to protect the island's pocosin wetland habitats, which support a plethora of rare carnivorous plant species, including famed Venus flytraps, butterworts, bladderworts, and pitcher plants. Park visitors can explore more than six miles of hiking trails or peruse the park's visitor center, which showcases natural history exhibits on the region's unique ecosystems. A marina is also available for visitor use, along with overnight campgrounds and day-use picnic sites. 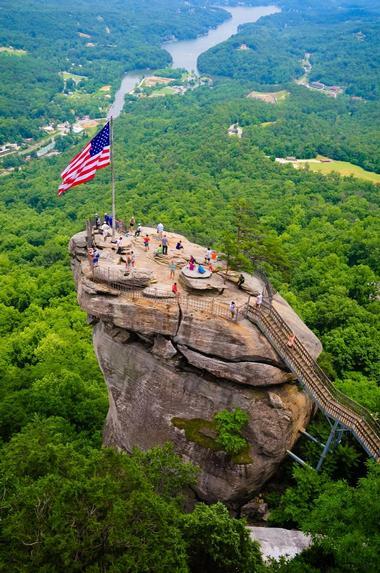 Chimney Rock State Park is a striking state park in Rutherford County, conveniently located less than half an hour southeast of the city of Asheville. 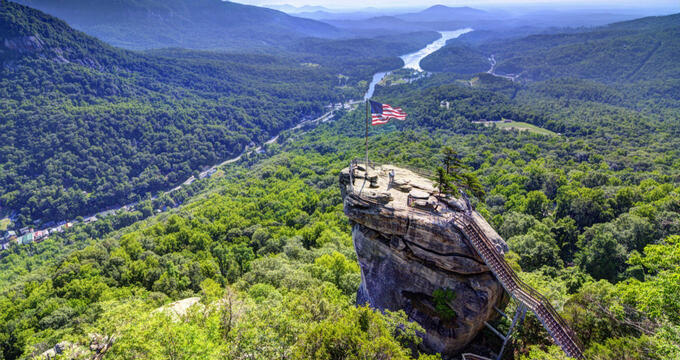 The 6,807-acre park is renowned for its dramatic scenery, including sites such as its namesake 315-foot spire granite formation that overlooks Lake Lure and Hickory Nut Gorge. Park visitors can ride an elevator to the top of the spire for stunning panoramic views of the surrounding countryside or observe the unique Devil's Head balancing rock. 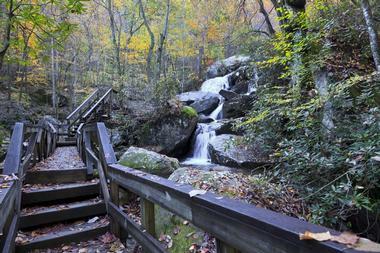 Six hiking trails are offered throughout the park, including family-friendly nature walks and a moderately strenuous route to the impressive 404-foot Hickory Nut Falls waterfall. Trout anglers can also enjoy excellent fishing conditions on the Rocky Broad River, which is bordered by family attractions such as miniature golf courses and a public riverwalk on its banks across from the park. Cliffs of the Neuse State Park is a 1,094-acre state park overlooking the beautiful natural landmark Neuse River, North Carolina's longest river, which extends for 275 throughout the Piedmont and empties into the Pamlico Sound. The park was originally established in 1945 by Lionel Weil and the Wayne Foundation and serves as an important preserved habitat for more than 420 species of native plants and trees, along with animals such as river otters, northern parulas, prothonotary warblers, and a variety of nonvenomous snake species. Park visitors can enjoy a designated 11-acre swimming lake during the summer season or peruse the park's museum, which features exhibits on the region's significant geological and ecological history. 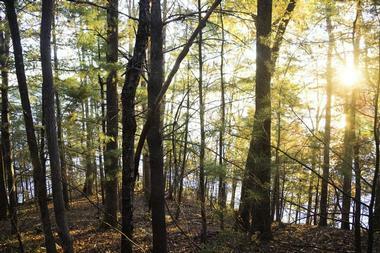 Five hiking trails traverse mature forest habitats, leading to excellent fishing areas along the river. Visitors can also stay overnight at the park's campground facility, which offers a large family campground and three rental cabins. Crowders Mountain State Park is a popular rock climbing destination in North Carolina's south-central region, located in Gaston County near the city of Gastonia. 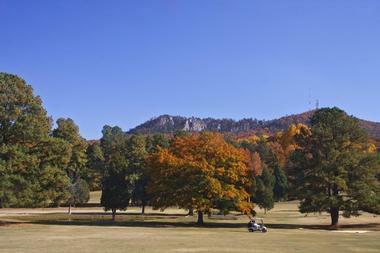 The park is best known as the home of the twin Pinnacle and Crowders Mountain peaks, which are technically classed as monadnocks and are believed to be the eroded remnants of historic mountains that once towered in the area 500 million years ago. Visitors can enjoy challenging hikes throughout the park on 11 public trails, including the strenuous Ridgeline Trail, which connects to nearby Kings Mountain State and National Military Parks and offers access to the Pinnacle. The Crowders and Backside Trails lead to the peak of Crowders Mountain, which offers stunning 25-mile panoramic views of the surrounding Piedmont area and the nearby skyline of Charlotte. A nine-acre lake offers excellent fishing opportunities, with canoe and boat rentals available. Backcountry campsites are also available with permit. Elk Knob State Park is one of North Carolina's newest state parks, opened to the public in 2003 after efforts by citizen groups and the Nature Conservancy to preserve the Elk Knob region from commercial development. The park, which surrounds Watauga County's highest mountain peak, spans 3,680 acres within the Blue Ridge Mountains, approximately 10 miles from the city of Boone. Though the park's facilities are currently in the process of development, year-round activities are already available, including one of North Carolina's only opportunities for cross-country skiing during the winter months. A hiking trail offers views of nearby peaks in Tennessee and Virginia, and a backcountry camping area is accessible via permit. Visitors can also view exhibits or attend community days related to the region's mountain communities, developed by faculty and students at nearby Appalachian State University. 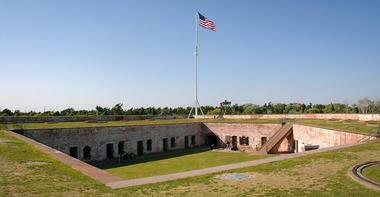 Fort Macon State Park preserves the restored Civil War-era fort of the same name, which is most noted as the site of the seminal 1862 Battle of Fort Macon. The park, which is located along Bogue Banks near Atlantic Beach, was originally opened to the public in 1936 and is North Carolina's second most-visited park today, despite clocking in as one of its smallest at a mere 424 acres. Visitors can explore the fully resorted fort as part of self-guided tours, with a variety of exhibits on display and cannon and musket demonstrations showcased throughout the day. A coastal education center is also offered at the site, along with a protected swimming area during the summer months and opportunities for surf and soundside fishing. Goose Creek State Park is a charming 1.672-acre park near the Pamlico Sound, located approximately two miles south of U.S. Route 264 near the city of Beaufort. 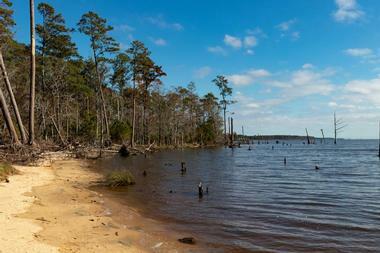 The park area, which was historically the home of the Secota and Pamlico indigenous tribes, was preserved during the 1970s as part of citizen efforts to revitalize the Goose Creek ecosystem following the prevalence of the timber industry in the region in the 19th and 20th centuries. Today, the park offers eight miles of public hiking trails, which meander through gorgeous wetland and swamp environments and provide habitats for species such as white-tailed deer, black bears, bobcats, and a variety of wading and migratory birds. Other year-round activities at the park include boating, fishing, and swimming at Goose Creek, with a designated boat ramp available for use at Dinah's Landing. Overnight camping is offered at the park's primitive campground site, while nature and history exhibits are showcased at its visitor center. Gorges State Park is an immense state park in Transylvania County, spanning nearly 8,000 acres near the Jocassee Gorges. 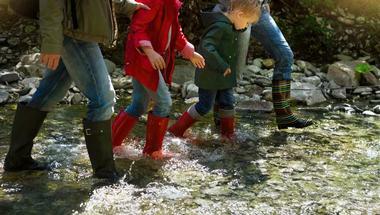 The park is one of North Carolina's newest-developed state parks, purchased in 1999 by the state from the Duke Energy Corporation for environmental protection of the gorges' sensitive second-growth forest habitat. Year-round recreation opportunities are available for visitors, including opportunities for hiking, biking, and horseback riding along the park's many nature trails. 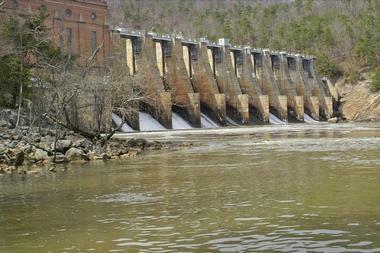 At the South Carolina border, the manmade Lake Jocassee reservoir serves as a prime area for trout and bass fishing. Museum-quality exhibits are offered at the park's visitor center, while opportunities for primitive camping are available at several sites throughout the park. 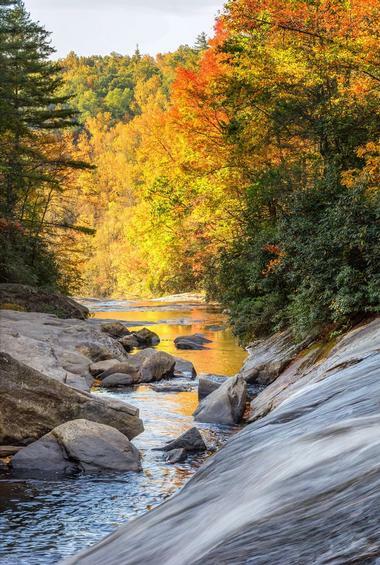 Nearby in bordering Pisgah National Forest, connector trails provide access to landmarks such as Rainbow and Turtleback Falls. 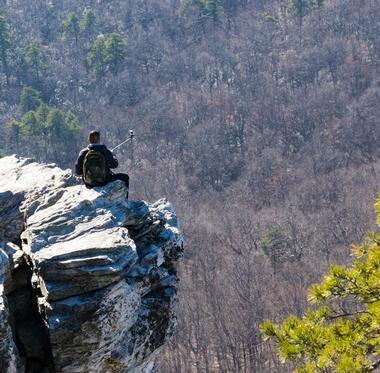 Hanging Rock State Park was originally created during the late 1930s as a state project park of the Civilian Conservation Corps, meant to protect the region from potential mountain resort development. Today, the park spans 7,869 acres throughout Stokes County, located approximately half an hour north of Winston-Salem within the gorgeous ancient Sauratown Mountain Range. A number of original CCC-constructed structures at the park remain and are listed on the National Register of Historic Places, including the park's 12-acre manmade lake and bathhouse, which are accessible for swimming and boating during the summer months. Over 20 miles of hiking trails traverse the park, providing opportunities to hike past waterfalls and up to peak summits for unparalleled views of the surrounding region. Rock climbing is offered at Moore's and Cook's Walls, while overnight accommodations are offered at the park's 73-site campground and 10 rental cabins. Jockey's Ridge State Park is North Carolina's most-visited state park, preserving the eastern United States' tallest living sand dune system. 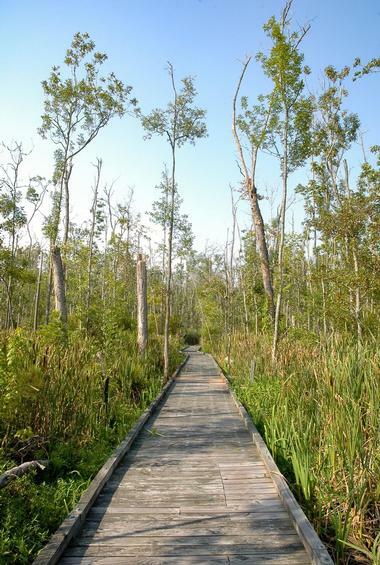 The park, which is located in the city of Nags Head, is open to the public year-round and also preserves gorgeous maritime forests near the Roanoke Sound. 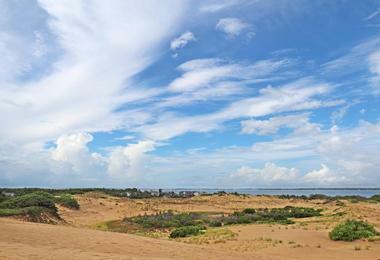 Visitors can stroll along the park's 360-foot boardwalk or explore its family-friendly museum exhibits, which detail the unique ecology of its sand dune habitats. Sandboarding is popular along the park's Atlantic Ocean coastline, with hang-gliding lessons offered via vendors during the summer months. 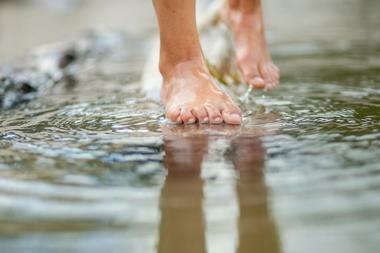 On the park's soundside, visitors can swim, sunbathe, kayak, or explore a mile-long nature trail. The park also offers unique opportunities for visitors with mobility concerns to reserve all-terrain vehicle rides to the top of the sand dunes. Kerr Lake State Recreation Area is a popular state recreation area set around the 50,000-acre manmade Kerr Lake reservoir, which is named in honor of United States Congressman John H. Kerr. The park offers seven separate access areas throughout Warren and Vance Counties, located near the city of Henderson and the state's northern border with Virginia. Visitors can access several designated swimming areas throughout the summer months, including areas offering 24-hour designated access for campers. Two private marinas are also available for boaters and fishers looking to get out on the lake's waters, and a boat ramp at the Nutbush Access area serves as a popular site for fishing tournaments. Visitors can stay overnight at five of the park's access areas, with accommodations ranging from primitive campsites and RV hookups to reservable group camps. Lake James State Park surrounds the pristine 6,812-acre lake of the same name, located within Burke and McDowell Counties near the city of Nebo. The park, which spans an additional 3,644 acres on land, was originally established in 1987 and offers more than 25 miles of visitor trails, including 15 miles of trails available for use by mountain bikers. Trails include educational family-friendly hikes such as the Discovery Trail and the moderately strenuous Overmountain Victory Trail, which showcases historic sites connected to the American Revolutionary War. Visitors can rent canoes, kayaks, and paddleboards at the Paddy's Creek Area during the summer months or enjoy use of boat ramps at both of the park's day use-areas. A boat-in campground is available along the Long Arm Peninsula, with family-friendly walk-in campsites offered at the Paddy's Creek and Catawba River Areas. Lake Norman State Park, formerly known as Duke Power State Park, preserves year-round recreational lands surrounding one of North Carolina's largest manmade reservoirs, originally created in the early 1960s. 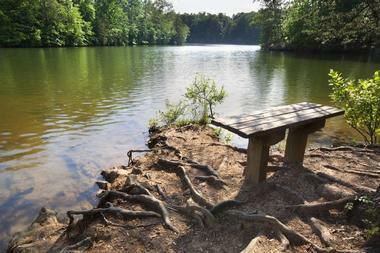 The park, which is located within Iredell County near the city of Troutman, spans the lake's northern shoreline near the mouth of Hicks Creek and offers seasonal amenities such as a 125-yard swimming beach and public bathhouse. Boat ramps are also available for use during the warmer months, along with a number of trail-access fishing spots perfect for catching largemouth and smallmouth bass, yellow perch, crappie, and bluegill. Visitors can also enjoy more than 30 miles of mountain biking trails throughout the park or stay overnight at one of 33 campsites available on a first-come, first-served basis. Lumber River State Park is designated as both a North Carolina state park and a National Wild and Scenic River overseen by the United States Department of the Interior. The sprawling 11,259-acre park spans more than 115 miles of the Lumber River's coastline, stretching throughout Columbus, Hoke, Robeson, and Scotland Counties and extending to the state's southern border. Park visitors can use 24 boat launch access for canoeing, kayaking, and fishing for largemouth bass, redbreast sunfish, black crappie, and catfish. Interpretive programming at the park also offers opportunities for ranger-led fishing and paddling excursions. Two overnight campsite areas are offered at the park's Princess Ann and Chalk Banks access points, which include group campsites and picnic areas. Medoc Mountain State Park spans nearly 4,000 acres throughout Halifax County near the city of Hollister, anchored around the 325-foot ancient eroded granite Medoc Mountain. The park is located along the former property of 19th-century farmer and winemaker Sidney Weller, who gave the area its name after a famed winemaking province in France's Bordeaux region. Today, visitors come to the park for prime fishing opportunities along Fishing Creek, widely considered to be one of the region's cleanest publicly-accessible streams. 10 miles of hiking trails are also accessible, including trails climbing to the mountain peak's summit and a number of equestrian-friendly routes. A 34-site campground offers RV hooks, a bathhouse, and group camping facilities during the summer months. Each year in October, the park also hosts the 10-mile Medoc Trail Marathon. Merchants Millpond State Park preserves 3,447 acres of historic lands within North Carolina's coastal plain, located within Gates County near the city of Gatesville. The park is anchored around the 700-acre Merchants Millpond, which was constructed in the early 18th century to serve the gristmill processing of the region's early white settler communities. The pond operated until the beginning of World War II and was preserved following land donations to the state of North Carolina in the 1960s by A.B. Coleman and the Nature Conservancy. Today, park visitors can rent canoes for paddling experiences on the lake and nearby Lassiter Swamp, including opportunities for overnight stays at remote canoe-in campgrounds. 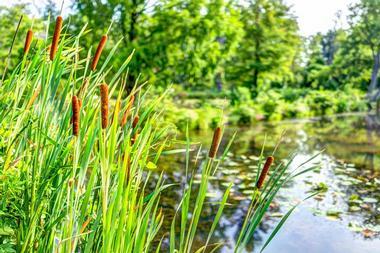 Nine miles of hiking trails also surround the scenic pond, with several segments open to bikers. 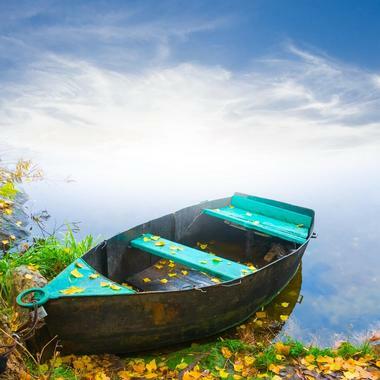 Other popular activities include fishing, boating, and wildlife watching for alligators. Morrow Mountain State Park is a 4,747-acre state park anchored around its namesake mountain, one of the highest peaks within central North Carolina's Uwharrie Mountain range. The park, which is located near the city of Albemarle in Stanly County, is home to more than 15 miles of public hiking trails, along with 16 miles of bridle trails, making it one of the state's most-hiked park facilities. A scenic overlook atop Morrow Mountain offers day-use picnic areas and panoramic views, while boating opportunities are offered throughout the warmer months at Lake Tillery. 106 tent, RV, and trailer campsites are offered at the park's family campground facility, which is also home to a public swimming pool and bathhouse. Other attractions include a visitor center museum and the preserved historic 19th-century Kron House. Mount Mitchell State Park preserves the highest peak east of the Mississippi River, which stands 6,684 feet above Yancey County. The park, which was established in 1915 as North Carolina's first state park, stretches 1,996 acres near the city of Burnsville, accessible via NC 128 and the Blue Ridge Parkway. More than 400,000 visitors attend the park annually to ascend its summit-top 360-degree raised observation platform, which showcased spectacular views of the surrounding mountain scenery. Other peaks reaching above 6,000 feet within the park include Mounts Halback and Craig and Balsam Cone. Visitors can explore the historic Camp Alice logging and tourist camp on Mount Mitchell or peruse museum exhibits showcasing the region's natural and cultural history. A seasonal restaurant is also offered, along with a nine-site campground facility. 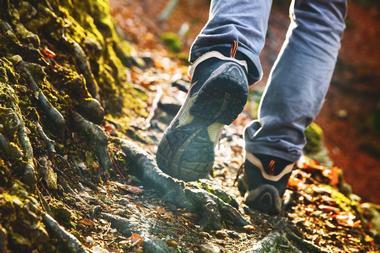 Backpackers can pick up the Mountains-to-Sea State Trail within the park's boundaries, which stretches between the Great Smoky Mountains National Park and the Outer Banks. New River State Park protects one of the United States' oldest rivers, widely believed to be one of the oldest rivers in the world at a maximum age of up to 360 million years old. The 2,911-acre park, which is located near the city of Jefferson in Ashe County, is anchored around the beautiful New River, which has been protected as a National Wild and Scenic River since 1976. Park visitors can explore the area's gorgeous mountain scenery and enjoy seasonal activities such as canoeing, paddling, and fishing for smallmouth and redeye bass, rainbow and brown trout, and muskellunge. Stunning second-growth forest areas showcase Carolina hemlock and pines, creating a habitat for more than a dozen endangered plant species. Hiking trails are also offered, along with primitive canoe-in campsites, day-use picnic sites, and a visitor center showcasing natural and cultural history exhibits. 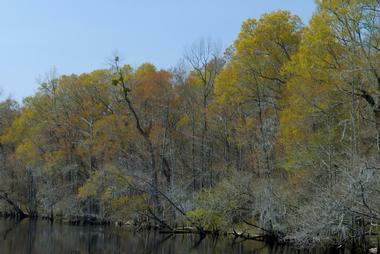 Raven Rock State Park is a favorite hiking destination in Harnett County, located near the city of Lillington. 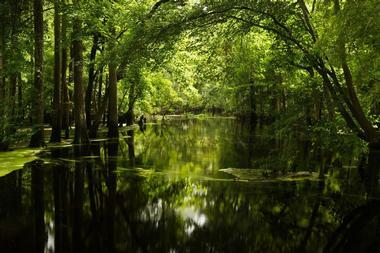 The 4,964-acre park sits on the banks of the Cape Fear River along the eastern edge of the state's Piedmont region and has been protected by the state as a natural reserve area since 1969. It is anchored around the immense eroded rock carving of the same name, which reaches 150 feet above the river's skyline. Hiking and horseback riding trails include the five-mile Campbell Creek Loop, the 1.5-mile Little Creek Loop, and the 2.6-mile Raven Rock Loop, which leads to a beautiful river overlook site. Primitive backcountry camping areas are available for overnight stay throughout the park, including paddle-in sites. Museum-quality exhibits are offered at the park's visitor center, which also frequently presents ranger-led educational and interpretive programming. South Mountains State Park is one of North Carolina's most rugged state parks, covering an immense 19,830 acres throughout the South Mountains area of the Blue Ridge Mountains in Burke County. The park, which is accessible near the city of Connellys Springs, is best known as the site of the gorgeous High Shoals Falls, tumbling more than 80 feet over a bareface rock cliff along Jacob's Fork River. More than 40 miles of hiking trails are offered throughout the park for visitors on foot, mountain bike, or horseback, including access trails to 20 backpacking campsite areas. Equestrian camping is also offered, with more than 33 miles of bridle trails available throughout the park. Trout fishing is popular at the Jacob's Fork River, which reaches mountain stream elevations of up to 3,000 feet. Other visitor attractions include seasonal drive-to campsites and a visitor center featuring museum-quality natural and cultural history exhibits. Stone Mountain State Park is an expansive North Carolina state park stretching nearly 15,000 acres throughout Alleghany and Wilkes Counties, anchored around its namesake National Natural Landmark dome mountain, which reaches elevations of more than 2,300 feet above sea level. 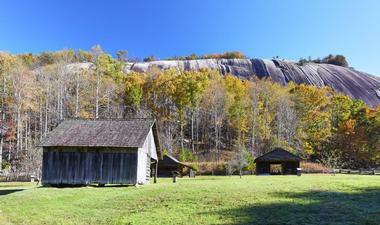 The park serves as one of North Carolina's best sites for rock climbing, offering panoramic views of the nearby restored 19th-century Hutchinson Homestead from climbing sites along the mountain's granite face. Visitors can explore the homestead Thursdays through Sundays between March and October and view its preserved log cabin, blacksmith shop, barn, meat house, and corn crib. Seasonal religious services are held at the 1897 Garden Creek Baptist Church, while natural and cultural history exhibits are showcased at the park's visitor center. More than 18 miles of hiking trails are also offered, along with excellent conditions for trout fishing along the park's mountain streams and creeks. Cape Hatteras National Seashore is a 72-mile United States National Seashore located along portions of North Carolina's Outer Banks region, stretching from Bodie Island to Ocracoke Island. The National Park Service-managed seashore is a paradise for water sport enthusiasts, offering opportunities for boating, fishing, surfing, windsurfing, and kiteboarding throughout the summer months. Visitors can explore the history of the Outer Banks region at Hatteras Island's Museum of the Sea, located within the preserved keeper's quarters of the historic Cape Hatteras Lighthouse. 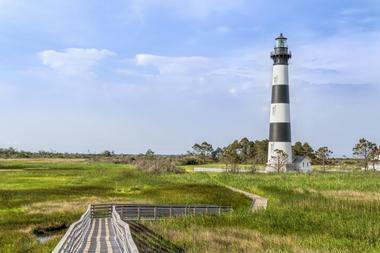 Two other visitor centers are offered on Bodie and Ocracoke Islands, which are both home to historic lighthouses that may be toured seasonally. Overnight camping experiences are available seasonally at four campgrounds throughout the seashore, including electric hookup campsites at Oregon Inlet Campground. Cape Lookout National Seashore protects 56 miles of coastline along North Carolina's Crystal Coast, spanning from the northern Ocracoke Inlet to the southeastern Beaufort Inlet. The National Park Service-managed seashore encompasses the coastlines of the Shackleford Banks and North and South Core Banks barrier islands, originally designated in 1966. It is best known as the home of the Banker Ponies, a population of wild horses that are believed to be descended from shipwrecked Spanish mustangs that arrived in the region in the 16th century. Visitors can explore the historic 18th-century Portsmouth Village, preserved as a ghost town and open to travelers on foot or as part of ATV tours. 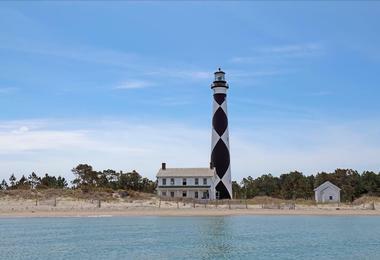 The historic Cape Lookout Lighthouse is open for tours during the summer months, located on South Core Banks. Ample opportunities for shelling, fishing, birdwatching, and water sports are offered throughout the summer months, along with overnight stay opportunities at the seashore's primitive campsites. Great Smoky Mountains National Park is the most-visited national park in the United States, attracting more than 11 million tourists each year, more than twice the amount of visitors to second-place Grand Canyon National Park. The UNESCO World Heritage Site-designated park straddles the Tennessee-North Carolina border along the Blue Ridge Mountains' beautiful Great Smoky Mountain range, known for their perpetual hazy fog, lush forests, and abundant year-round wildflower blooms. 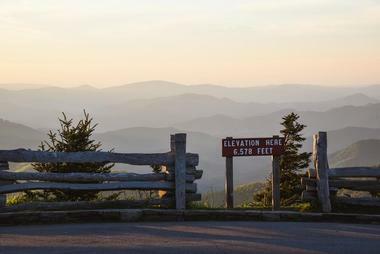 At over 522,000 acres, the park is one of the largest protected natural sites on the American East Coast, home to spectacular attractions such as the Clingmans Dome observation tower, which stands at an elevation of 6,643 feet. Preserved historic mountain structures are showcased at Cades Cove, showcasing the history of old-time Appalachia. 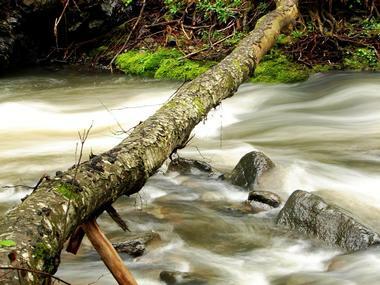 Over 850 miles of hiking trails lead to stunning waterfalls and natural sites, including trails connected to the Appalachian Trail. Tourists can choose from a variety of luxury accommodations throughout the Cherokee, North Carolina and Gatlinburg, Pigeon Forge, and Sevierville, Tennessee mountain resort areas.